Rustic Painted Snowflake Ornaments Tutorial. 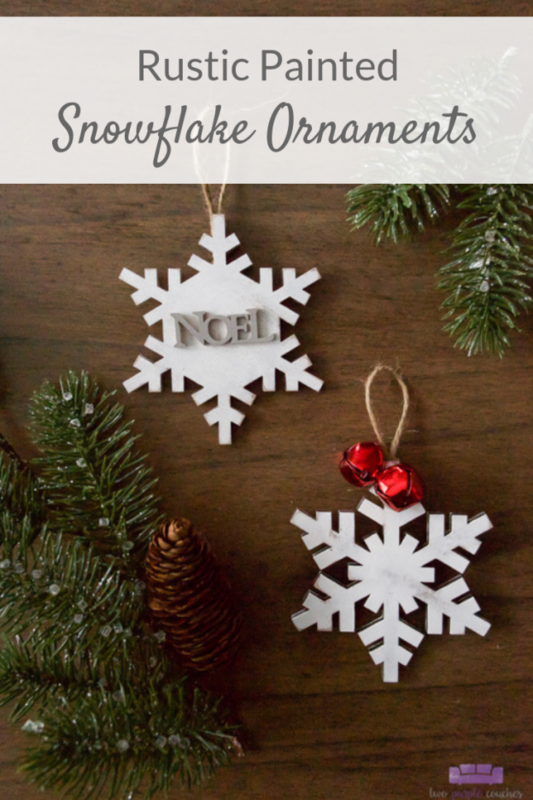 Create a handmade winter wonderland with these easy DIY white-washed wooden snowflake ornaments. These rustic wooden snowflake ornaments are a simple craft you can make for your Christmas tree. They also add a beautiful handmade touch as a gift topper! Keep reading for a full tutorial and supply list, along with 47 additional homemade Christmas and holiday ornament ideas! 1.) Begin by mixing the Dark Chocolate and Terra Cotta paints. Then paint both sides of the wooden snowflakes. 2.) Once dry, paint both sides with one to two coats of Snow White paint, depending on how opaque you want the white paint to be. When the painted snowflakes are completely dry, sand lightly with fine-grit sandpaper for a slightly distressed, rustic look. 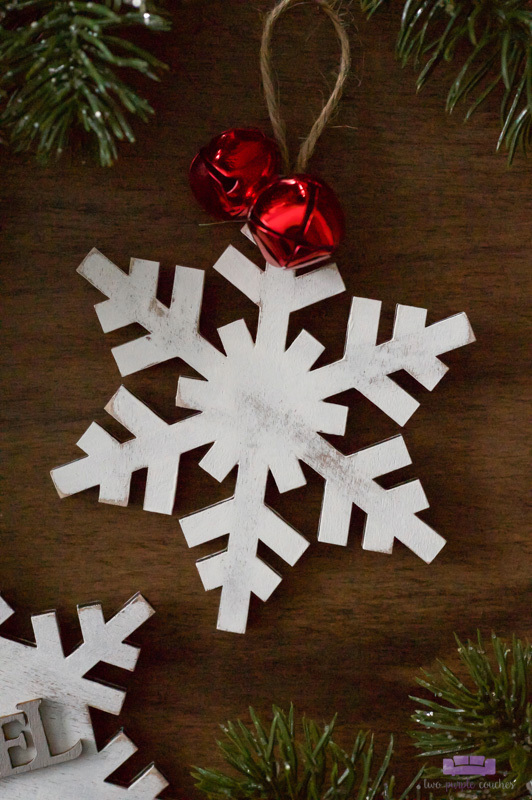 If you’re not into the distressed look, you can skip Step 1 and go straight to painting your snowflake ornaments with white paint. 3.) Paint wooden word(s) in Artifact grey. 4.) 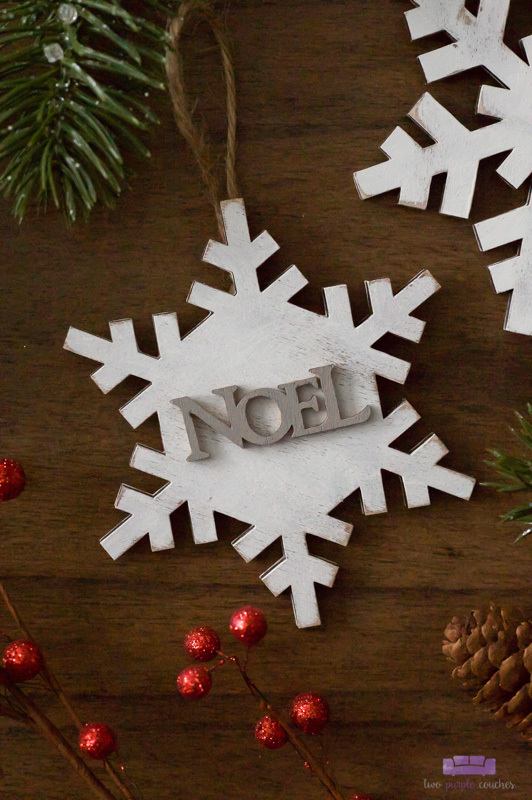 Use Titebond Wood Glue to adhere the wooden word to the front side of the snowflake. 5.) If your wooden snowflake ornaments don’t already have a hole for hanging (mine did not), loop and tie a piece of twine. 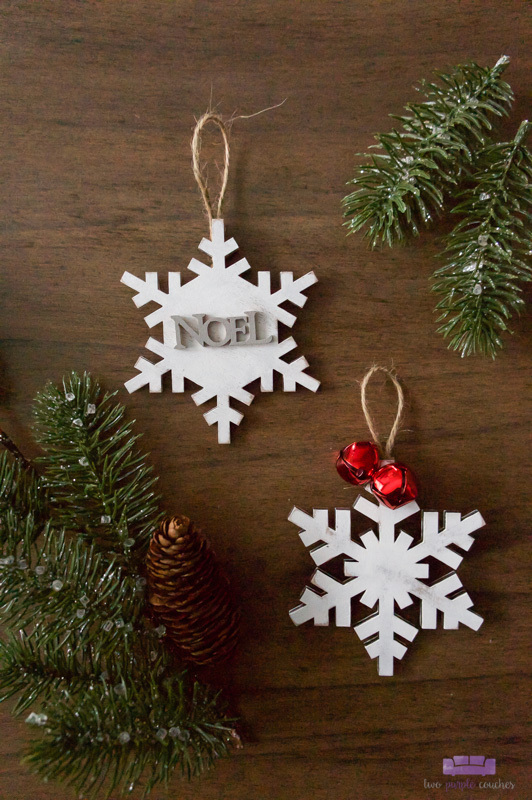 Adhere to the back of each snowflake ornament with hot glue. If you’d like to add jingle bells, thread these through the twine before gluing down to the ornament. 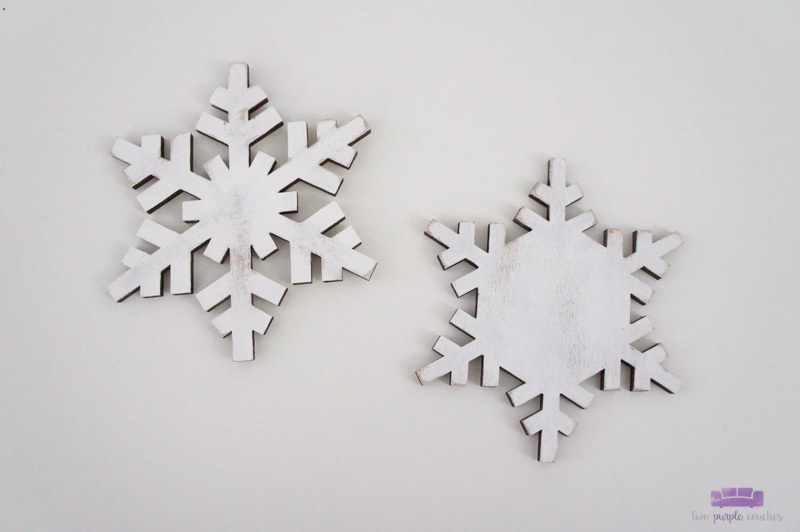 These rustic wooden snowflake ornaments are simple, but so pretty. And easy to make, too! These would also be so cute personalized with a monogram wooden letter and used as gift toppers or to adorn Christmas stockings! Honestly, the possibilities are endless! Love this craft? Don’t forget to Pin It or Bookmark It! You can hop on over to Domestic Deadline to see the ornament that Emily created for me! And be sure to jump over to our Ornament Exchange Link Party to see all 48 ornaments created for the Exchange, plus you can add your own handmade ornament tutorials until December 15th! Happy Holiday Crafting! Emily! I had so much fun getting to know you and doing this exchange with you. I love my ornament and for the first time, am actually contemplating putting my tree up before Thanksgiving! Thank you so much! I did, too, Emily! I’m so glad you love your ornament 😀 I am itching to get our tree up, too! Oh those are cute! They’d be a really fun craft to make with kids or grandkids or as a classroom project. 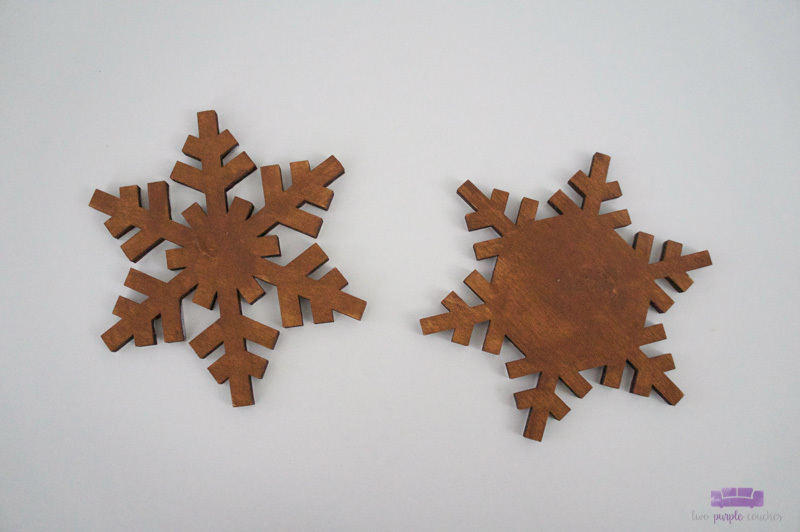 The wooden snowflakes are so cute! I love them both and can’t decide which one is my favorite. Thanks Jenny! Same here, that’s how I ended up with two, haha! Liked them both too much to choose! These are wonderful. I love what you did with them. So bright and merry. Thank you Evija! I wish I’d made one for myself! These came out so great Emily! Love these for the farmhouse look! I just love these! I have a “thing” for snowflakes and snowmen (even though I don’t really love them in real life!). Pinned. How pretty. I love snow flake ornaments. Love that you changed them to white. The embellishments are great, too. So cute! We don’t get real snow here, so these are the perfect snowy touch! I love these. They’re so cute and classy, but my kids could probably help make them! Yes! So easy & definitely kid-friendly! You always come up with wonderful ornaments. The snowflakes are so adorable. These are so cute! I love snowflakes at Christmas. Will definitely have to add these to my to do list! 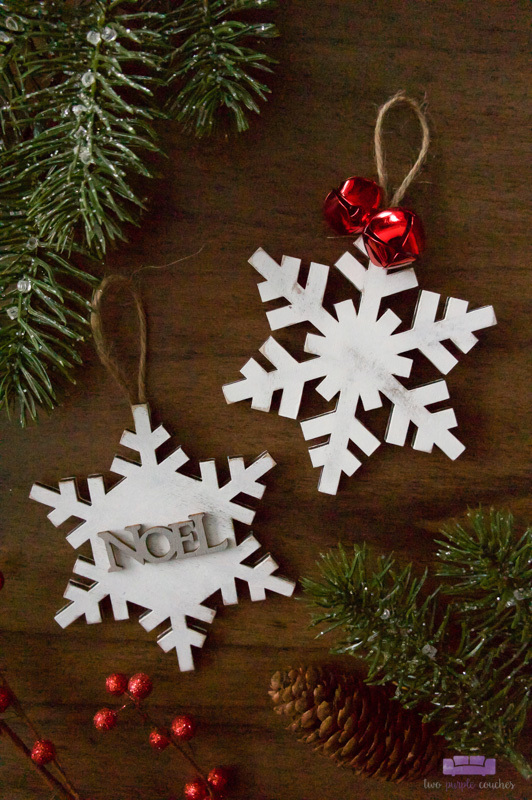 Can’t go wrong with snowflake ornaments. I have a ton of snowflake ornaments in and these would make a great addition to any Christmas ornament collection. Thanks Erlene, I love snowflake ornaments, too! Sweet as can be . I love the country feel. Pinning to my ornament board.